As to the status of Jerusalem, according to the UN General Assembly Resolution 181, November 29, 1947, Jerusalem is to have a "Special International Regime for the City of Jerusalem." See the full text of the Resolution of the General Assembly, December 9, 1949 (UN Doc. A11245, December 10, 1949) on an International Regime for the Jerusalem Area and Protection of the Holy Places.  Varda Mühlbauer, her husband Arik, and Evelin were wandering through Jerusalem in March 2004 and Varda said that we should have one of our future annual meetings for our HumanDHS group/network at some point in Jerusalem, the Peace Capital of the World. Is not this a wonderful image, Jerusalem, the Peace Capital of the World! We all know that reality currently is flying in the face of this dream, however, hope needs dreams, and without dreams we have no direction for action. So, why not promote the idea of Jerusalem, the Peace Capital of the World against all odds! "Regarding Jerusalem, city of peace, the original name for Jerusalem was Shalem, meaning peace. See Genesis 14-18. Yru in early Hebrew/Chaldean means "city". Thus Yru-Shalem or Yerushalayim (Jerusalem), city of peace. There are also other sources in the Prophets."  Later, when Herbert Lurie launched the idea of having parts of Jerusalem developed as ex-territorial area, similar to the Vatican, Varda wrote (personal message, 20th December 2004): "I also thought that certain parts [of Jerusalem] should be ex-territorial. My idea is that international institutes - such as U.N and others who pursue world peace and other issues - should move to Jerusalem. This is to say, not merely a Vatican - which is exclusively the territory of one religion - rather the place for the 3 religions combined with international institutes pursuing world peace and overall care for people."  At our 2007 Workshop on Humiliation and Violent Conflict in New York, Arie Nadler and Yoav Peck aired the idea to organize a HumanDHS Conference on Humiliation in Jerusalem. 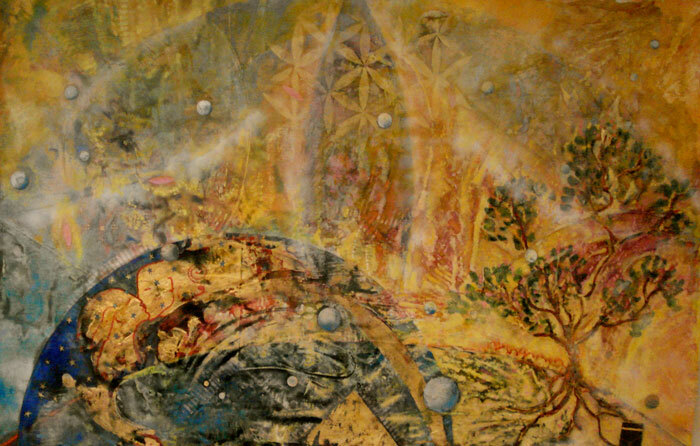  Please see here a painting by Katrina Vrebalovich entitled "New Jerusalem - the golden city of tolerance dedication to the betterment of humanity through all forms of study and communication - a free place for every one - a heart of transformation" that Katrina generously contributes to this page. She writes on 28th April 2009: "Yes, you may use New Jerusalem. Anywhere it can do its magic and activate love and golden wisdom of inclusion, encouragement, and a vision that we all live on this little planet - the old ideas of boarders, walls etc., all that create separation, creates fear and the unknown..."
"New Jerusalem - the golden city of tolerance dedication to the betterment of humanity through all forms of study and communication - a free place for every one - a heart of transformation," painting by Katrina Vrebalovich entitled that she generously contributes to this page. Uploaded on 29th April 2009. Read the full article at http://www.humiliationstudies.org/news/2007/08/common-ground-news-service-bulletin-01-07-august-2007/.